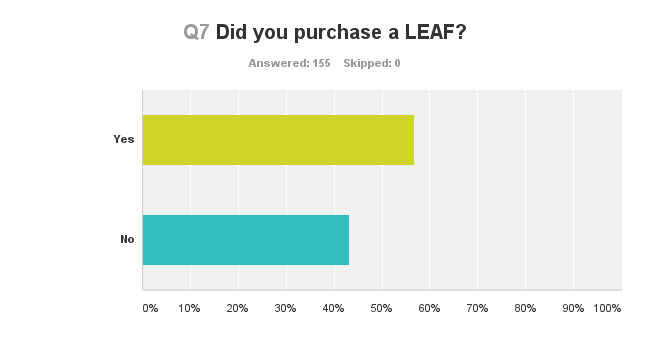 So… I forgot about this Nissan LEAF Shopper Survey a few times now, but we got 155 responses from Nissan LEAF shoppers (and the last one came in just about 1 day ago), so I think it’s time to finally share the results. Suggested lease, not buy. Said not a good investment. Said it was for city use only. I know more about this car. Harped on about range and range anxiety. said to me it was a city car and not made for the country and there wasn’t enough charging stations to support it and a waste of time to wait until it was charged up that the extra money spent on gas was worth my time he said a nissan leaf in comparison to a nissan Versa the cost is the same by the time you pay for gas and maintence. 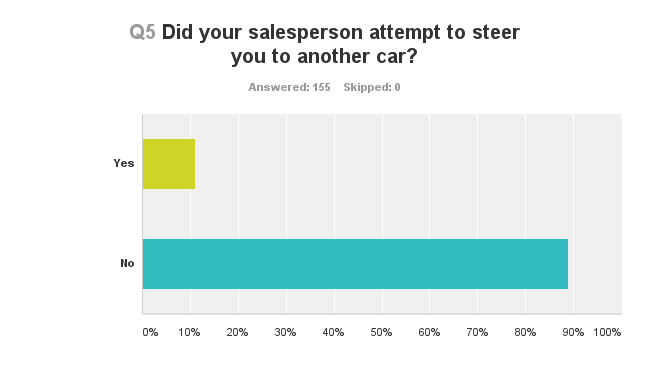 ~11% of respondents said that their sales representative tried to get them into a different vehicle. 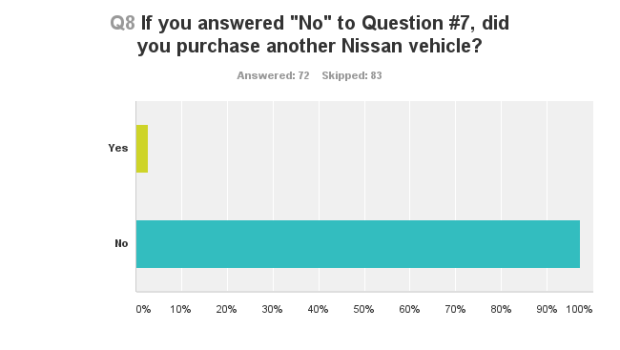 Of those 11% (17 respondents), the most common alternative pushed on the Nissan LEAF shoppers was the Nissan Versa, followed by the Nissan Altima and then Nissan Maxima and Nissan Sentra. 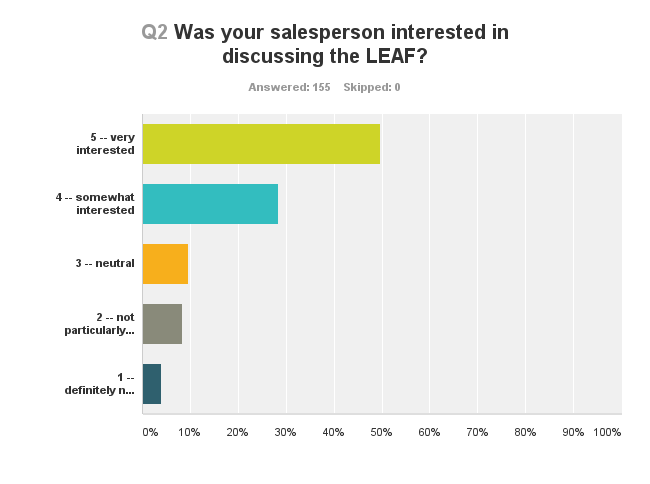 In the end, 57% of respondents said that they ended up buying the LEAF. 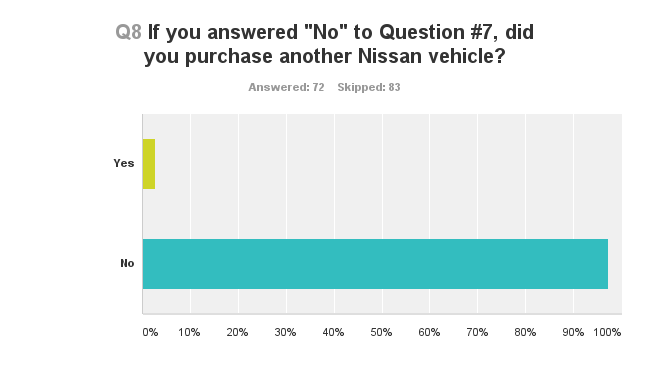 Of the 67 respondents who didn’t buy the LEAF, only 2 went on to buy another Nissan vehicle (one went for the Nissan Maxima and one went for the Nissan Juke). 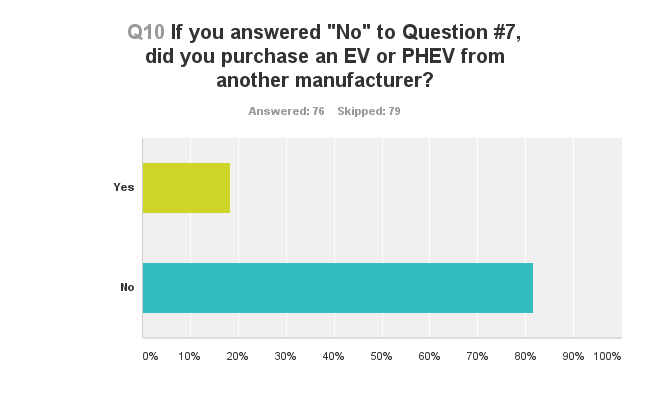 However, 14 (18%) went on to buy another plug-in car. 60% (9) of them bought the Chevy Volt, 13% (2) bought the Ford Focus Electric, 13% (2) bought the Tesla Model S, and 4% (1) bought the BMW i3. I got 61 extra comments on the bottom of the survey as well. Many focused on how horrible the sales experience was. Many noted that they went to another Nissan dealer where a salesperson was better. One person went to 5 dealerships and all had bad service (but he had actually already bought one and was simply checking out how the sales process at various dealers). 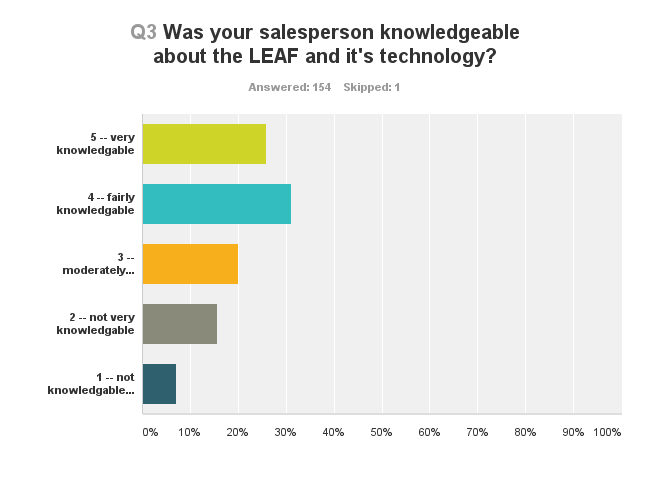 Some noted that they were still planning to buy the LEAF but hadn’t yet (that would have been a good answer choice to include). And one noted: “Several dealership did try to steer to other cars but Doug McIntosh at Autonation Nissan in Lewisville was a terrific salesman. 11 friends have bought leafs from him in 4 months.” Kudos to Doug! 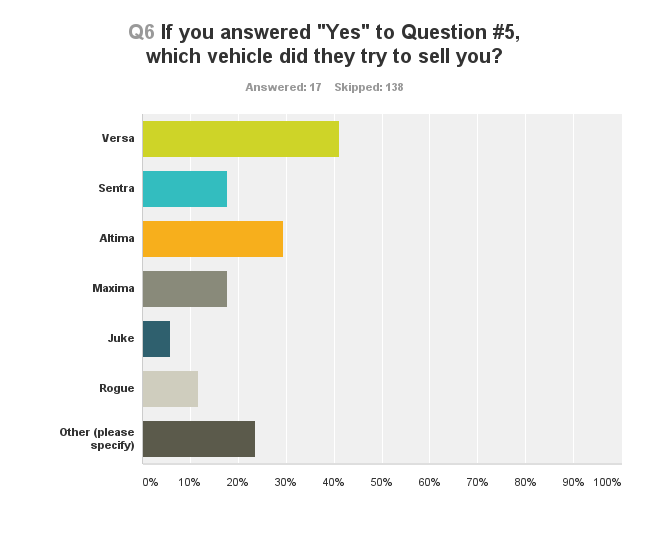 And here was one surprise: “Best sales experience in buying a car in my life, from start to finish. Totally surprised.” Wondering if his salesperson was Paul Scott… but if not, certainly must have been another EV enthusiast. Was this a representative survey? Of course not. This survey was only shared here on a cleantech website and on sites or social media networks where readers took the time to reshare it. 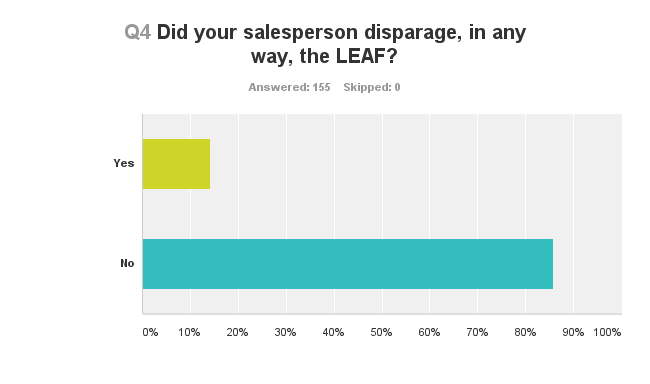 I imagine a representative sample would result in more LEAF shoppers being steered away from the LEAF, and more of them thinking the salespeople were actually very knowledgable about the LEAF. Again, these are the results for the top-selling electric car in the US and the world, one that its manufacturer is strongly behind. Imagine the results for all of the other plug-in cars on the market! Any wonder why Tesla won’t go through dealerships?